Gather with others as they tap on an oven rack attached to strings tied to fingers that are stuck in your ears, and listen to primal sounds of the universe. This book explains how to fong. It's very simple and you can do it with anyone. By understanding the simultaneous silliness and splendor of life, we learn to create a better and more peaceful world through inanity. With many helpful illustrations, because you'll need them. You can also get the Official Fonging Kit, which includes the book and everything else you need to get started. "The best book on fonging ever written!" "Who ever imagined anything so ridiculous could be so enlightening. "Fonging is humorous therapy for the soul." 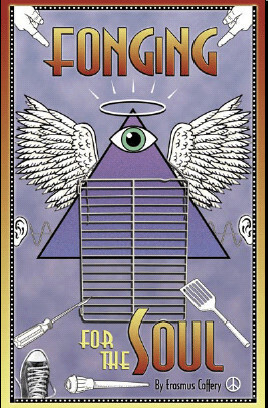 The Washington Post recently called 'Fonging for the Soul' an "excellent book ... , which delves into the co(s)mically spiritual practice of hanging an oven rack from your fingers and then sticking said fingers into your ears while others tap the rack with kitchen utensils." Watch the Intro to Fonging. Watch the Elevator Fonging Video. Watch the Homeless Fonging Video. Watch the Safe Fonging Video. Watch the What is Fonging Video.